As the new season approaches I’ve been putting in some time and thought on rod and reel setups. With a smaller boat and a limited budget I can only run a certain number of setups that need to be flexible enough to cover a wide range of applications and a variety of species. A good article by Jason Sealock on Wired-2-Fish suggests that six rod/reel combos should be sufficient and flexible enough to do this. While my six setups are more geared to my preferences, six looks like it will cover most applications I can think of. An important consideration for these will be fishing line choice. I generally don’t intent to swap out line between outings so I need to have flexibility in this regard as well. Of course, there will always be trade-offs and the choices I make may not match your own. 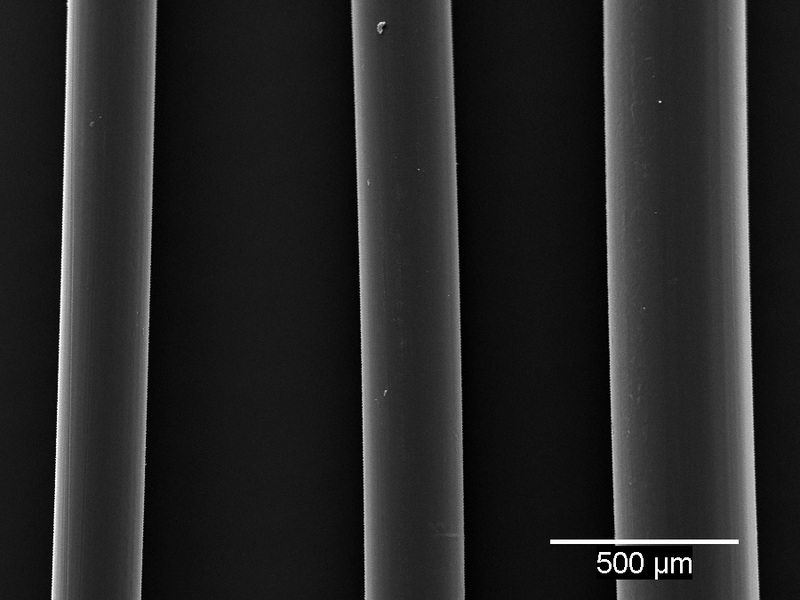 A scanning electron microscope (SEM) image of 6 lb (left), 8 lb (center) and 15 lb (right) fishing line (all same brand and type). A couple of general notes to start with. I generally won’t go below 8 lb test for most applications with the possible exceptions of perch or brook trout fishing. My feeling is that the risk of losing fish and tackle with lighter line is not generally not worth any marginal gains. I know there are those who swear by going to 7, 6 or even 5 lb fluorocarbon (leaders) when drop shotting and with other finesse techniques. The move to lighter line really doesn’t have anything to do with line visibility as the difference in line diameter between 8 lb vs. 6 lb test is only 30 microns – a difference that can barely be discerned under a microscope, let alone at 15 feet of depth in even relatively clear water (see the SEM images above). The difference is in the increased suppleness of the lighter line which allows for a livelier and more natural appearance to your bait. Fluorocarbon lines, although abrasion resistant and nearly invisible underwater, suffer from the fact that they are quite stiff compared to monofilament. To combat this I’ve been using a fluorocarbon coated copolymer (P-Line Fluoroclear) that is much more supple than the equivalent weight fluorocarbon while still being nearly invisible, and it holds a knot better than fluorocarbon. I’m still testing different straight fluorocarbons so this may change – I’ve had good recommendations for Seaguar Tatsu and Sunline Sniper FC so I plan on trying them this year. For applications where suppleness is less of a factor I’ll use straight fluorocarbon instead of the copolymer, especially where less stretch, better feel, and abrasion resistance is needed. The move to lighter line really doesn’t have anything to do with line visibility as the difference in line diameter between 8 lb vs. 6 lb test is only 30 microns – a difference that can barely be discerned under a microscope, let alone at 15 feet of depth in even relatively clear water. Wacky, Neko, Ned (Midwest Finesse) Rig, Shaky Head, Jigs/Grubs: 10 lb braid main line (high visibility red or yellow), 8 lb fluorocarbon leader (see note above). Drop Shot, Jigs/Grubs: 10 lb braid with 8 lb copolymer leader or straight 8 lb copolymer (preferred – can break off and retie faster without having to retie leader to braid knot). Crankbaits, Chatterbaits, Spinnerbaits, Swimbaits: 12 lb fluorocarbon for most – 12 lb seems to be a good starting point. In situations were a shallower or deeper running depth is needed going to heavier or lighter line can help accomplish this. 15 lb fluorocarbon or copolymer for heavier baits. Flipping, Pitching, Frogging: For the general lighter flipping, pitching and frogging that I do in this area I’m currently using 40lb braid. Of course if you’re in an area with super dense cover moving up to 65 to 80 lb makes sense. I’m a relative novice to this type of fishing but the few pieces of advice I got from a local flipping guru include: 1) Avoid using the smoother braids as a rougher surface will help you cut through the weeds when you’re trying to work the fish out of the thick stuff. 2) A snell knot will dramatically improve hookups for flipping and pitching. 3) Retie often becuase the weight and weeds can chew up and weaken the line. 4) Use a dark magic marker to colour line that has faded from muddy water use. The whitened line is more visible to the fish. Carolina Rig: 15 lb fluorocarbon or 40 lb braid mainline (most use 20-30 lb but I’m trying to be flexible with my setups). Generally use a monofilament leader (10 lb) to keep bait up off the bottom. If using fluorocarbon, use lighter wire hook to try to keep bait up. So there you have my line choices for 2017. I’m hoping they provide the flexibility needed for all the different applications I’ll be using this season. Although I don’t really want to add (or can fit in my boat) any more rods there is the possibility that I can add an extra reel or two into the mix. This way, depending on application, I can just swap out a reel spooled with the appropriate line as needed. Largemouth Bass, Northern Pike, Smallmouth Bass, Tackle, Techniques, Walleye.